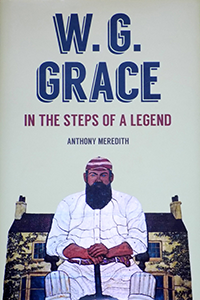 Anthony Meredith previously wrote an excellent book on Lord’s and has now brought out a further book on W.G.Grace further celebrating the anniversary of possibly the most famous cricketer’s death. As the title suggests, it is very much in the steps of the cricketing legend, taking the reader via his own visits to many places in Bristol, Crystal Palace in London and Beckenham, where the great man is buried. Photographs testify to the many places where associations with Grace can still be seen in, predominantly, Downend in Bristol and parts of London. Some places, sadly, have succumbed to modernisation but Anthony’s latest book is an excellent addition to any cricket lover’s library. It is, though, far from being a visit to places where the legendary cricketer resided and had associations with. Anthony’s biography of W.G. is of an ideal length yet is written – and beautifully written, if I may say – encompassing all aspects of the Grace family and is not solely about their extensive cricketing exploits.Written in a respectful way but with a touch of humour, references to W.G.’s apparently ever-expanding waistline pop up the bigger he became! One of W.G.’s soubriquets was Doc or Doctor but it does appear that the great man, encouraged to follow in the footsteps of his father, was not perhaps initially the most diligent general practitioner from one or two examples within the book. He knew his worth too and how to make a comfortable existence from the game which he continued to play until almost the very end of his remarkable life. days when Grace was playing to the present day and Anthony Meredith’s venture naturally includes some such tales. has written a little gem and anyone reading it will, like me, learn a lot more about W.G.Grace.